Video Remote Interpretation is a great solution for virtual communication between your staff and Deaf/Hard-of-Hearing or Limited English Proficient individuals in a variety of settings like medical, mental health, government, legal, educational, and others. Spoken languages currently offered include but are not limited to Arabic, Bosnian, Burmese, Cantonese, French, Haitian Creole, Hmong, Korean, Mandarin, Nepali, Polish, Portuguese, Russian, Somali, Spanish, Vietnamese, as well as American Sign Language. Additional languages may be offered as per Customer’s requests. Virtually Connect with qualified, experienced and professional video interpreters in seconds, when you need it, at any time, on any device, over any network. Click Telephone Interpreter button for Audio Interpretation in over 200 languages 24/7/365. Our video application runs on your iPad, Android tablet, smartphone, PC, Mac or your existing videoconferencing system that is already in place (e.g. Polycom, LifeSize, Cisco/Tandberg). Regardless of the business or application, we deliver low-latency HD-quality multipoint video communication over any IP network to any end point, wherever you have internet connection. 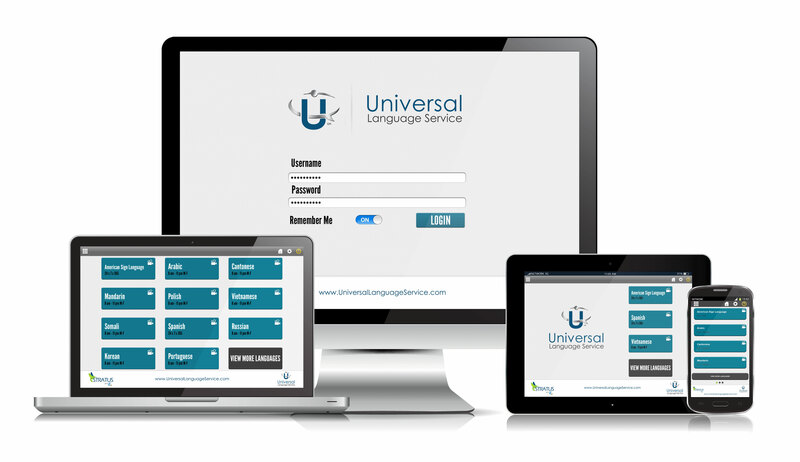 Simply download the application, set up an account and start using Universal Language Service Video Interpreting. Why choose Us for Video Remote Interpretation? To download: open the App Store app on your device and search for Stratus Video Interpreting or click here. To update: open the App Store app on your device and click on “Updates” at the bottom of the screen. Update the Stratus Video Interpreting app. Once installed, login with your username and password. How to access the Google Pay Store app on an Android device Instructions. To download: open the Google Play Store and search for Stratus Video Interpreting or click here. To update: open the Google Play Store app on your device. Touch Menu > My Apps to view your downloaded apps. Select the Stratus Video Interpreting app. Note: On a tablet, you may need to touch Downloads to view your apps. Click on the links below to download or update the software on your computer with the latest version. You may have to ask your IT department for assistance. To learn more about Video Remote Interpretation, inquire about free, no obligation demonstration and/or pricing quote, complete the Contact Us form below or call us at 1-888-462-0500.